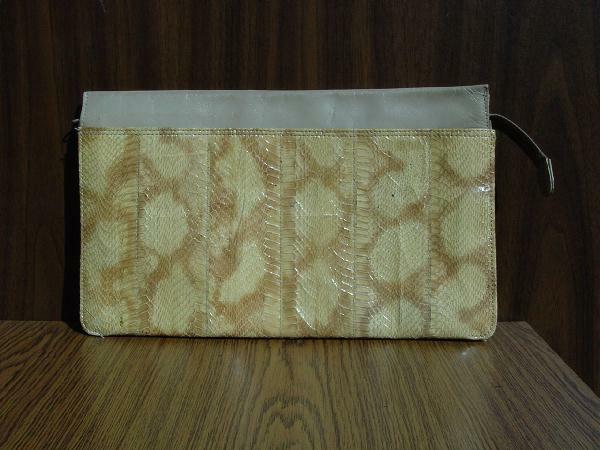 This vintage snakeskin clutch has shades of caramel throughout. The beige leather is flaking a little bit where you hold it. There are two outside compartments as well as a center zipper section which has 2 separate compartments, one of which has a deep interior zipper pocket. The lining is in a light tan-cream color. There are a few ink marks on the interior bottom of the two outer compartments. There are some imperfections in the skins. It was used for photo shoots, including one in the desert where the model was posed in an ATV.